Welcome to Day 2 of the 2017 NFL Draft. This page is dedicated to the second and third-round this year. Providing fast points on the players selected from a data perspective. There are a lot of talented players at this point of the draft. So buckle in for a great day of drafting even if your team didn’t draft someone you wanted. So to rattle off a few thoughts from Day 1. I found the Browns’ draft to not be perfect, but it’s clear the metrics they value most. Explosiveness and speed. 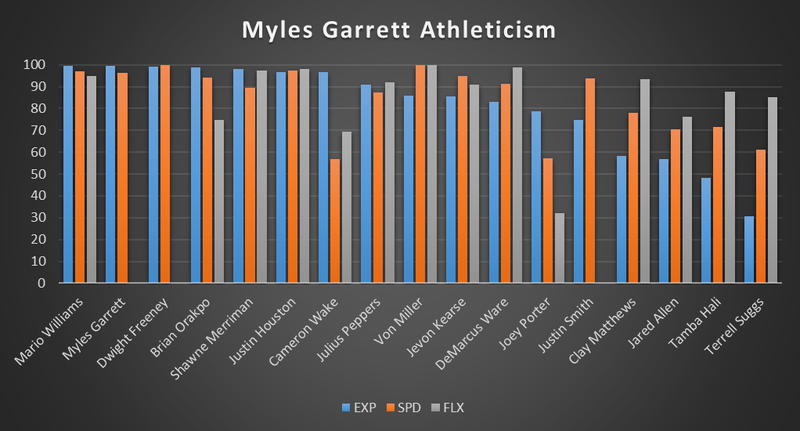 Myles Garrett, Jabrill Peppers and David Njoku all had 90+ percentile explosiveness compared to their positional peers since 1999. And Garrett/Peppers also had 90+ percentile speed for their size. Two drafts in a row, the Browns have valued explosiveness and speed. Which makes it safe to say this is a real trend. A trend that can pay off as Garrett, Peppers and Njoku all hit decent production marks. Except for Peppers who is closer to T.J. Ward in terms of interception market share production. However, I still believe Peppers has the athleticism to become a T.J. Ward like outlier. But he is the one pick I’m the most nervous about from a data and film perspective. Best data potential to become a multiple Pro Bowl CB in this class. Will struggle with above average explosive and flexible pass rushers. Almost identical profile to Richard Seymour coming out of Georgia. Lacks elite explosiveness and flexibility for his size, but could become a star due to freakish size and length. But lacks Weddle’s elite interception and pass deflection market share. Will be a test case as he is very young, but does not have similar markers to Tyrann Mathieu, Earl Thomas or any of the other top safeties he’s been compared to. Elite market share production coming out of East Carolina. In addition to elite flexibility for his size. Jones has all the ingredients to become a Jordy Nelson like wide receiver one. Elite overall athleticism for his size grading similar to Brian Waters. You can’t go wrong with Lamp inside. Produced in similar way to Budda Baker. Has Kam Chancellor athleticism traits. However, there are better safeties in this class. Elite speed with Pro Bowl production. Has the ability to become just as impactful as John Ross in terms of mismatch ability. McCaffrey and Samuel is a deadly combination. All-Pro production markers with above average speed. Last RB to become a Pro Bowler with his 3-Cone was Demarco Murray since 1999. However, he could be that type of outlier due to his production. Similar profile to Haha Clinton-Dix with better athleticism. Has a chance to be the best safety from this class. Poor athleticism with positive production. Could be A.J. Bouye like. Good overall athlete with great production. Elite level athleticism with very good market share production. There are some level of competition concerns, but he’s has a great combination of size/athleticism traits. Sean Smith like athlete with similar production. Great overall athleticism with tremendous production. He has the potential to become a multiple Pro Bowl Edge Rusher. One of the best RB athletes in the class. Poor athleticism with decent production. Very high of a pick. Decent production across the board. He lacks speed and didn’t perform agility drills that is concerning. Poor flexibility for his size with above average explosiveness and speed. Did not meet starting level high school production. But hit starter level college production. But has elite pass deflection market share. Pro Bowl level solo tackle market share. With decent overall athleticism, but lacks flexibility to be dominant in coverage. With some above average athleticism traits. Has great solo tackle and pass deflection market share. But lack elite interception market share. Daryl Smith in terms of production and athleticism. Has potential to be a very good long-term starter. Above average explosiveness and speed. He doesn’t have elite FCS production though, which limits his upside. Tyrann Mathieu like production with Marcus Gilchrist athleticism. He’s one of the best free safety/nickel corners in the class. Elite explosiveness and speed with great production. He lacks the flexibility to be an elite strong safety, but he can be a very good starter. Elite market share production at a decent age. Film is concerning in terms of development. Great overall athleticism traits to be elite inside. Elite explosiveness and flexibility for his size. Lacks elite height at offensive tackle, but will be a great fit at right tackle. Great overall athleticism and production. Great size and length with above average explosiveness. Has not been a multiple Pro Bowl RB with his production since the 1983 NFL Draft Class. Decent production, but lack elite athleticism traits. Good FCS Production with above average flexibility. But could be a starter as an outlier. Great overall Pro Bowl level power guard athlete. And is one of the best finishers on film in the class. Great production market with elite flexibility for his size. Taylor has a chance to be a very good wide receiver long-term. Elite level athlete with great production. There are very few holes in his data profile. Ra’Shede Hageman in terms of having great size/athleticism, but poor production. Similar production profile to Reuben Foster. Minimum starter level production with decent athleticism. Has potential to be a starter. Has great size and decent athleticism. But lacks elite production overall. Some above average athletic qualities, but lacks starter level market share production. 3-Time Pro Bowl production with decent athleticism. Great athleticism, but his production is extremely suspect against his level of competition. Elite athleticism with only near elite length and very concerning production. Injury history is also very scary. However, his production for his level of competition is concerning. Above average athleticism for his size. But lacks elite FCS production. Elite production, age and athleticism. Has the potential to be the best wide receiver in this class. Luke Joeckel explosiveness with below average flexibility. Very poor overall potential to be a starter at tackle. Decent overall market share production. With ideal ZBS explosiveness athletic traits. Decent collegiate production, but lacks starter level high school production. But production is concerning in terms of quality outcomes. Very similar athleticism to Eddie Lacy as a Pro Bowl RB. With above average production and athleticism traits. Good overall production with starter level athleticism. Nothing special about his profile though. Very good flexibility for his size and production. But lack elite length and best only as a slot corner. Elite speed and decent overall production. Has some Pro Bowl upside, but more likely a long-term starter. Slot corner only with elite market share production. Below average solo tackle and pass deflection market share. Elite speed, but more likely a long-term starter only. Terrific production, but age and his strength of schedule are not doing him any favors. Could be Mike Williams on a budget in the right system. Poor overall production with below average explosiveness. Could become a starter at best. Very good production at the FCS level. Similar athletic profile to Carlos Henderson with above average explosiveness and speed. Older version of Marlon Humphrey with less athleticism. Great athlete with elite production. Level of competition is worrisome. Did not post exceptional production for his level of competition. Decent production, but very poor athleticism. Has chance to be backup to spot starter. Above average athleticism traits and production. Some concerns about football intelligence from Shrine Game practices. Had starter level college production and decent HS production. But not a clean quarterback profile by any means. Above average speed and decent production. Could become a long-term starter in the right system. Starter level production and some above average production traits. Averageish solo tackle market share. Not enough athletic testing to determine much. Metric Analysis: Patrick Ricard has a decent starter profile. Production from the FCS level is not as easy to project as FBS level. However, he did put up decent market share at Maine. Thus, I’d project as a backup to long-term starter only. He has some solid athleticism traits, but nothing jumps out as elite. Metric Analysis: NFL teams care more about raw numbers than what those numbers actually say about athleticism for size. D.J. Killings had a decent workout as a 187 pounder. But it would have been elite if he was 200-210 pounds. And even if he had the exact same pro day workout at 200 pounds. His production isn’t even starter level for his level of competition. I’d pass and focus on other corners with better athleticism for size and production. Metric Analysis: Roderick Johnson has an uneven data profile. He has near elite speed and great measurables. However, his below average explosiveness and flexibility are not a great combination for success. He’s a better fit inside as an athlete, but at 6-7, his height cancels that out. Thus, I’d project Johnson as a backup to potential long-term starter only with a high chance to disappoint with his profile. Here is my Big Board Horizontal board. Divided by the position I believe they will excel at. Here is a link to my recently released 2017 NFL Draft Analytics guide. It has over 500+ data profiles looking at all the data I use on this blog. The purchase helps to keep this blog going. So, buy it and share it if you are a fan of my work. Even leaving a comment and rating the guide is helpful as well. Any bit of feedback is appreciated. I will shift my focus for the next week looking at the future class up until the draft. And after the draft, I will focus on team based draft reviews. In addition to starting a YouTube channel where I will upload informative data based videos. This blog will grow to new heights this year. I’m happy for all who have checked out my posts. Left a comment. Or even subscribed, which helps me out a lot as well. The NFL Draft and analytics are a major passion of mine. And I am so appreciative of all the support I have received from y’all. So, Happy Easter and have a great next week.